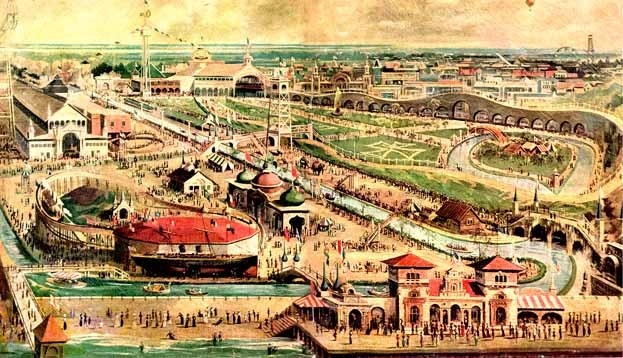 From 1897 to 1964, Steeplechase Park blew away the seaside crowds. Twenty-five cents got you admission to the park’s 25 rides, including the ferris wheel, steeplechase race, “trip to the moon,” and later, the parachute jump. Added to the park in 1939 by legendary founder George Tilyou, the parachute jump is the only remnant of Steeplechase that still exists. Today, the Brooklyn Cyclones minor league stadium occupies the site. It could have been worse. Donald Trump’s father bought the dilapidated park in the 1960s intending to raze it and build high-rises. Unable to change the zoning, he knocked it down and then sold the land to the city. This entry was posted on May 18, 2010 at 4:57 am and is filed under Brooklyn, Holiday traditions, Music, art, theater. You can follow any responses to this entry through the RSS 2.0 feed. You can leave a response, or trackback from your own site. I wonder if it could have been an early work by cartoonist Windsor McKay? Great connection. The timing is about right. Could it be? 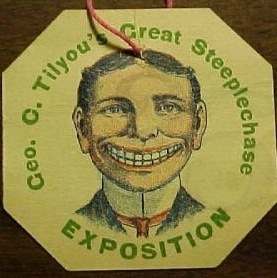 Never recovered from the scare of being chased by the clowns across the stage after riding the Steeplechase and before you left you could climb a few stairs up to an enclosed cage, to see a couple of “red bats”.